53.900 MW were added in the year 2018, slightly more than in 2017 when 52.552 MW were installed. 2018 was the second year in a row with growing number of new installations but at a lower rate of 9.8%, after 10,8% growth in 2017. All wind turbines installed by end of 2018 can cover close to 6% of the global electricity demand. The year 2018 was mainly characterised by new dynamics: While the European wind markets were on a decline, robust or even stronger growth has been observed in countries such as China, India, Brazil, many other Asian markets and also some African countries. 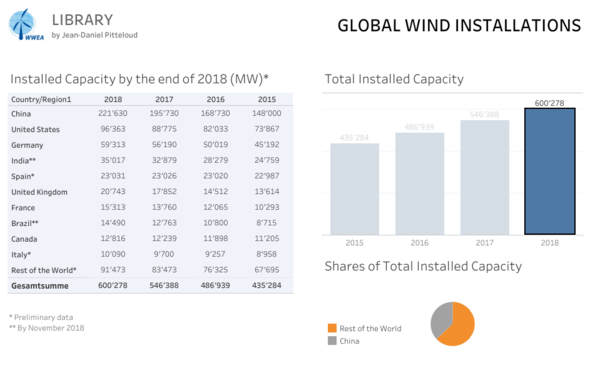 The by far largest wind power market, China, installed an additional capacity of 25.9 GW and has become the first country with an installed wind power capacity of more than 200 GW. It has re-taken the path of growth after a weaker year in 2017 when a comparatively modest 19 GW were installed. The second largest world market, the U.S., saw an increase in new capacity from 6.7 GW in 2017 to 7.6 GW in 2018. This positive development is certainly not only a result of the economics of wind power, but also of strong and comprehensive support on the state and municipal level. Stefan Gsänger, WWEA Secretary General: “The global transformation of the energy system towards renewable energy is on its way, and wind power is a major force in this development, having become a major pillar of power supply throughout the world. Some countries are making very good progress in accelerating wind power deployment rates. Such acceleration is imperative not only to achieve the objectives of the Paris Climate Change agreement and the Sustainable Development Goals, but also for every country to participate in the full socio-economic advantages of renewable energy.